This note, if I were Sherlock. 1. Author: Pre-adolescent girl. The sheer expressiveness of it makes that obvious, even if you failed to notice that the double exclamation marks were dotted with a smiley and the single exclamation with a heart. 3. There is a pronounced annoyance that proclaims that the writer (said girl) could not move on with her life (which most likely means removing skinny jeans and replacing them with jammie pants and then laying on her bed watching Netflix on her Kindle) until she got this unpardonable situation off her chest. I.e. – she is undoubtedly of the high drama sort. 4. The fact that she apparently could not handle (at almost 11) walking a 5 year old the three and a half blocks home from school, with the assistance of FOUR crossing guards, is somewhat alarming and tends to add weight to point 3. 5. 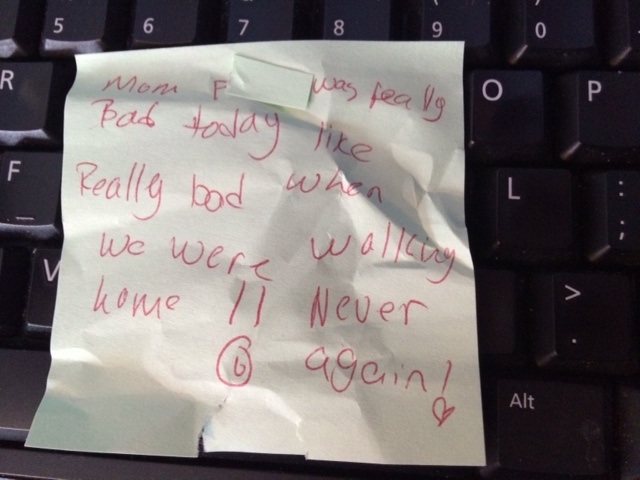 It appears that dishing out some discipline to the younger sibling is the note writer’s call to action. kids are horrible. 😉 But what would I write about?